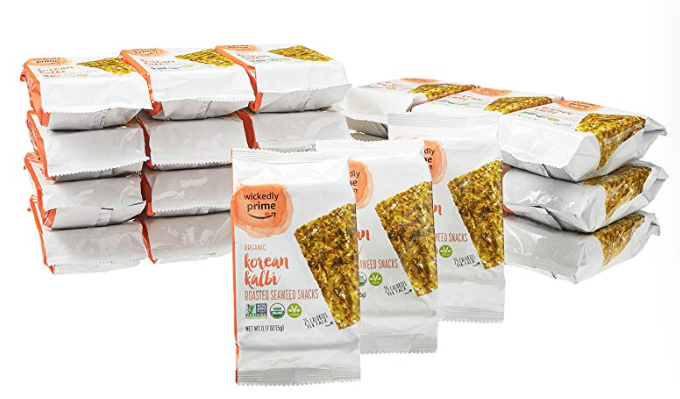 Get your iodine naturally with this hot deal on Wickedly Prime organic roasted seaweed snacks on Amazon! This snack is Korean Kalbi flavored and is also high is antioxidants, zinc, iron, Vitamin K and B vitamins. Prime members can clip a 30% off coupon on a 24 pack of single serve Wickedly Prime organic seaweed. As low as $8.78 after coupon and 15% S&S, so just $.36 a pack! This is the best price I’ve ever seen on seaweed snacks! Whether or not you choose Subscribe and Save, this is still an awesome deal! These seaweed snacks are gluten-free, vegan and certified organic.